ROCHESTER, NY (WXXI) – Frank Femia runs Klubfunstore Guns and Ammo in Henrietta, where the popular ammunition this season is copper bullets. “It’s been hard finding them because everyone’s been sold out of them and it’s been hard to keep in stock,” Femia said. A growing number of hunters in the Rochester area are shifting away from using lead bullets. Both hunters and health researchers are increasingly realizing the danger those bullets pose to humans and wildlife. The state Department of Environmental Conservation has a web page devoted to encouraging hunters to use non-lead ammunition. The concerns Femia hears from hunters focus on the potential of eating meat tainted with lead, he said. 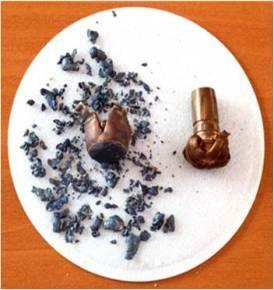 Lead bullets tend to fragment on impact and leave small pieces of metal scattered in the carcass. Gun ranges are trying to get customers to use copper ammunition, too. “They’re trying to get you to get away from lead, because the cleanup cost for lead is just astronomical,” Femia said. Katrina Smith Korfmacher teaches environmental medicine at the University of Rochester. Until recently, she said, she hadn’t realized how much of a risk lead bullets could pose to hunters. “When I sliced the data about the heavy metals registry for our region, trying to figure out where adults were getting exposed to lead, I was pretty surprised by these numbers,” Korfmacher said. She found that over two dozen people in a nine-county region surrounding Monroe County had elevated blood lead levels from shooting guns. That’s likely an undercount, Korfmacher said. “Those are just the people who noticed — or their family noticed — some kind of drastic shift in behavior or personality,” or who were mandated to be tested regularly because of their work. Korfmacher said she expects more people have been exposed to lead through hunting but have not yet noticed any ill effects. Although adults typically require a higher blood lead level than children to show symptoms of lead poisoning, “there is no safe level of lead,” Korfmacher said. There are environmental concerns about lead bullets, too. Korfmacher said scavengers that eat what hunters leave behind are prone to lead poisoning. Eagles in New York might be especially vulnerable, and California condors are already threatened with extinction partially because of ingesting lead from hunters’ bullets, she said. “Lead doesn’t ever degrade or go away. So when lead shot or bullets are used, anything that isn’t taken out in a carcass stays in the environment forever,” Korfmacher said.